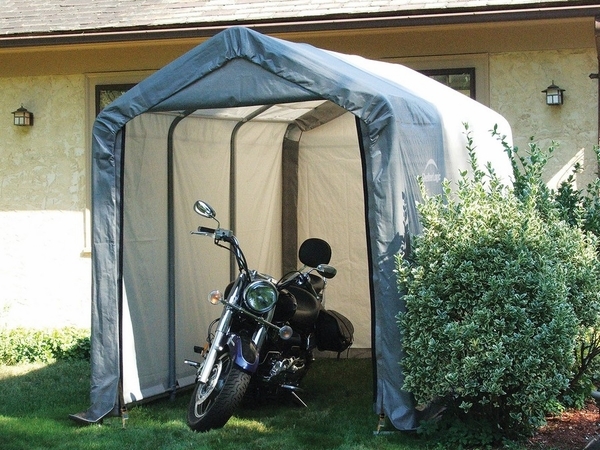 When it comes to instant storage, this 6x12-foot canopy "shed" has you and your equipment covered. It is covered with a beam-welded 1 3/8-inch steel frame prepared with a 13-step Rhino Shield process and bonded with DuPont thermoset, baked-on powder coat finish that won't rust, weather, chip or peel. Again it is covered with a heat-bonded, triple layer, polyethylene canopy cover that is UV treated inside and out against fading, aging, or harmful fungi. And additionally it is covered with cross rails that keep the frame true and Twist-tite technology that tensions the cover against the shed frame for a wrinkle-free look. 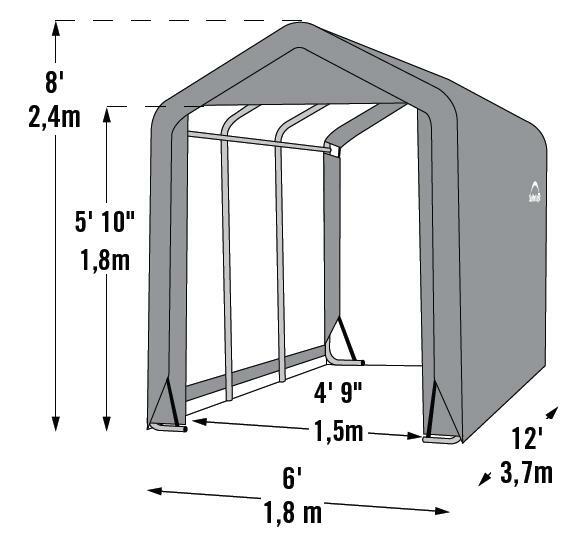 The canopy cover is tear-resistant, the wide-based foot pads on each leg, the auger anchors, and the ratchet tie-downs lock the shed in place, and the high profile white interior provides enhanced visibility. 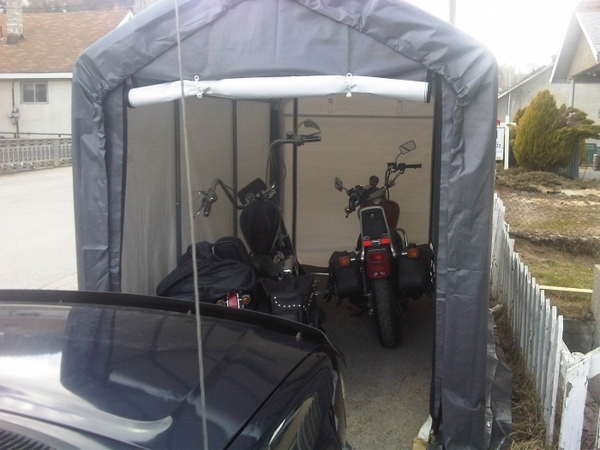 Can this shed protect my motorcycle through intense winters? This shed is UV treated inside and out with added fade blockers, anti-aging, anti-fungal agents and 100% waterproof. It is not, however, snow rated. ShelterLogic is a very well made and respected brand, so if I were to recommend anything, it would be ShelterLogic. I live in an area where covered parking is hard to come by. I was tired of seeing my bikes endure heavy rain storms with only a skimpy bike cover to protect them. I went online and found e-canopy's website and was impressed with the selection they had. I picked the 6x12 as it would fit both my bikes perfectly and take up minimal room. The transaction from beginning to end couldn't have gone any smoother. Shipping time was fast and e-canopy e-mailed me a tracking number. When I received it I was even more impressed. The quality of the structural pieces and the cover itself was of high quality material. Simple and descriptive instructions were included and every single nut and bolt was there to put it together. It only took a couple of hours and two of us had it up and ready. All and all I was very impressed and should I need another shelter I will definitely look to this store first. Great product. It took me 2 hours to put together. I am storing my motorcycle, kids bikes, lawnmower, and misc. stuff due to the fact I do not have a garage. I live in N.H. and we get some real crazy weather and so far this canopy has stood its grounds with high winds and heavy downpours. The real test will be this winter I can't wait to see how it will handle snow!! The price is right. You cannot find one that is priced this low and be so durable. I have searched all over the internet and this product, in my onion, is the best!! ConsNeeds better labeling on the poles. This was the only negative thing I had with this product. I had a hard time at first but commonsense finally helped out. I wasted 30 minutes trying to match poles. Some of them were smudged so it was just a case of process of elimination.